Reason enough to hunt grasslands. More ground than can be effectively hunted on just one day. Trophy whitetail ground. Specialized hunting skills required. Hunting over grass mixed with wood patches. 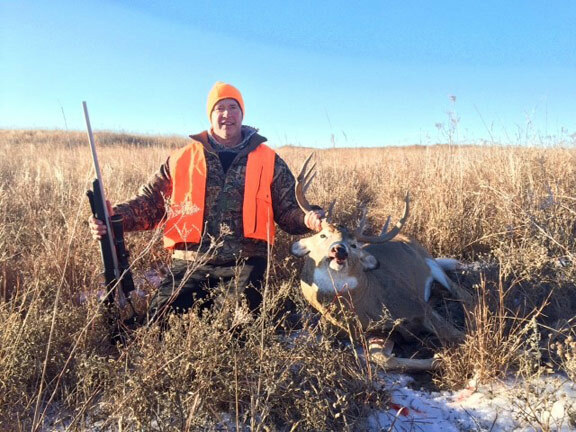 Grasslands Deer Hunting, It is not just about grass which typically grows 3 – 5 feet tall with some areas higher than a man can see over. It is inclusive of overhead wood cover, drainage’s of draws or swales some in grass and others in brush. All combined for total deer cover composed of concealment by both grass and woods. Year round water is a specialized scouting point. Grass with a little ground contour will cover a bedded or moving deer at close range. A case of being there with long term glassing required. Grass serves to diffuse deer movement different than wooded/crop terrain. Trails become narrow, habitual. Landmark movement common. Challenge is for hunters to recognize landmarks used by deer. There are many often unique to a field. Grass is also capable to hold more deer than farms in crops. Locals know tall prairie grass remains standing though winter. Exception being infrequent and not every winter heavy wet snow fall which may lay it down. During such years grass pushed down by snow often is at an angle making any movement difficult. During occasional freezing rain grass will become similarly impassible due to being tangled and frozen together. What is typical however is grass remains vertical most winters. Meaning through hunting season protective cover. This does not mean not to hunt grass. It means adjust to grasslands juncture with other cover. New to central mid-west deer hunter often express surprise at height and thickness of such grass. It being completely alien to many. This alien deer habitat is a mystery devoid of any trophy deer potential in their minds. Far is the truth from that idea. 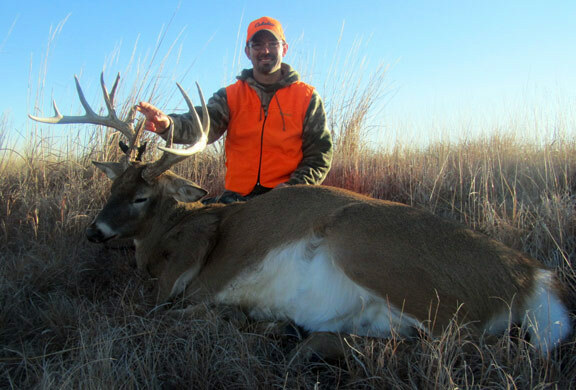 A hunter must adapt to deer attracting habitat of the great plains that has had deer evolving and surviving in the tall grass for eons. Any deer hunter who passes thinking a grass spot is not worth scouting or hunting has made a mistake. A final observation not to be missed is trees are capable of the best deer stands are typically at the lowest elevations. Down inside a drainage’s on sloped ground. Many well within sight cone of any deer traveling through higher elevation grass covered slopes. This often requires a hunter to be 30 feet in stand above. At the same time only 15 feet higher than a field at drainage top. Be safe with a climbing rope and harness. Rolling hills, tree lined creek bottoms common deer cover. That where most deer hunting occurs. 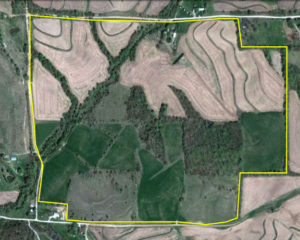 Common to Missouri deer hunting land within river bottom crop land country of cover folowing stream lines and ridges. It is difficult to show hill deer habitat as any aerial or ground level picture is limited at what it can illustrate. In the case we are highlighting common hill conutry found in Missouri’s better deer hunting region. Also in their 4-point one side zone. These pictures show Missouri, “The Rivers State”, ridge lines and hills follow water from small tributaries to rivers. Broad crop farm filled flat valleys. Deer holding habitat combination of cover and food which allows Missouri to have higher deer densities compared to Kansas. Compare this valley floor to the aerial above and see the near ridge with another behind it. This is typical of locally described rolling hills and timbered ridges deer country. These ground pictures are also deceptive. The amount of woody cover they seem to show. These tree patches are less impressive when scouting on foot. These edges are excellent to set up for turkey with a decoy or deer. This field in beans show deer sign along all wooded edges with the bean tops grazed by deer. Tree composition includes Bur Oak with its high volume acorn production. Acorns typically drop in mid September.